The English version below is a standard translation and not a direct result of the ‘Poets Translating Poet’ Encounter. Yet they write volumes on their distance and contrast. And a never ending feud rages between the dawn and the dusk. And there will be no distance left between the winter and the summer. 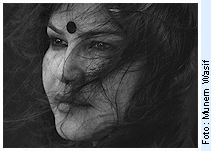 Shahnaz Munni, a renowned journalist and writer was born in Dhaka in 1969. She graduated from the University of Dhaka in Social Sciences. Though she is a television journalist, Shahnaz Munni has reflected her passion for writing poems, stories, juvenile literature and essays in the twenty books that she has authored.